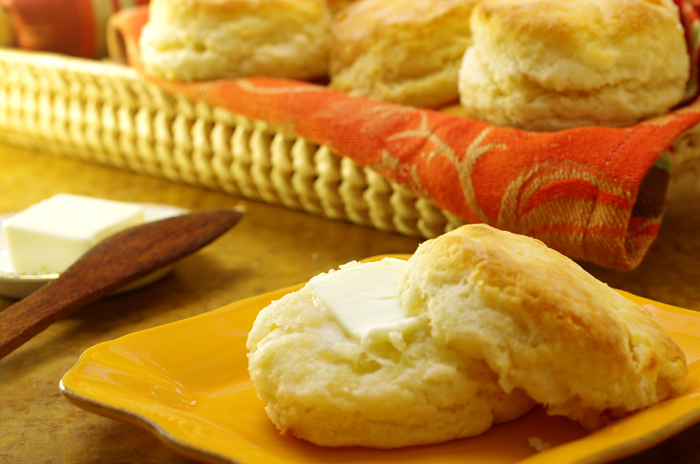 This is the standard biscuit of most regions in the country. The difference here is that Southern all-purpose flour has less gluten. 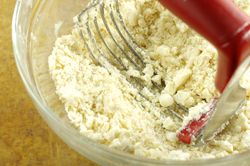 If using a national brand, start with just 1-3/4 cups of flour, or make a mix of half cake flour and half national-brand all-purpose flour. 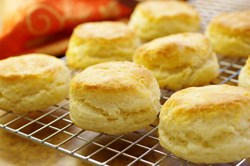 It has more fat than a humble biscuit, providing more flakiness and flavor. 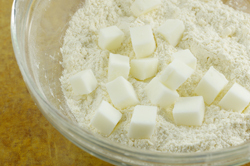 If a more crumbly biscuit is desired, increase the shortening to 3/4 cup. 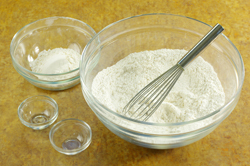 Fork-sift or whisk 2 cups of flour, the baking powder, and the salt in a large bowl, preferably wider than it is deep, and set aside the remaining 1/4 cup of flour. 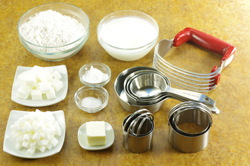 Scatter the 1/4-inch-size pieces of chilled fat over the flour and work in by rubbing fingers with the fat and flour as if snapping thumb and fingers together (or use two forks or knives, or a pastry cutter) until the mixture looks like well-crumbled feta cheese. Scatter the 1/2-inch-size pieces of chilled fat over the flour mixture and continue snapping thumb and fingers together until no pieces remain larger than a pea. Shake the bowl occasionally to allow the larger pieces of fat to bounce to the top of the flour, revealing the largest lumps that still need rubbing. If this method took longer than 5 minutes, place the bowl in the refrigerator for 5 minutes to rechill the fat. 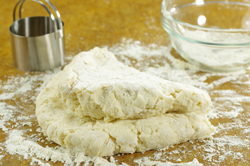 Lightly sprinkle a board or other clean surface using some of the reserved flour. 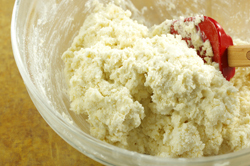 Turn the dough out onto the board and sprinkle the top lightly with flour. 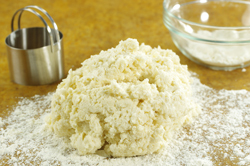 With floured hands, fold the dough in half, and pat dough out into a 1/3- to 1/2-inch-thick round, using a little additional flour only if needed. Flour again if necessary, and fold the dough in half a second time. 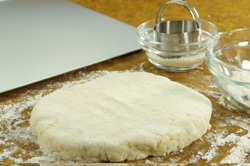 If the dough is still clumpy, pat and fold a third time. Pat dough out into a 1/2-inch thick round for a normal biscuit, 3/4-inch-thick for a tall biscuit, and 1-inch-thick for a giant biscuit. Brush off any visible flour from the top. 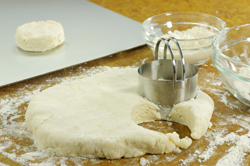 For each biscuit, dip a 2-1/2-inch biscuit cutter into the reserved flour and cut out the biscuits, starting at the outside edge and cutting very close together, being careful not to twist the cutter. 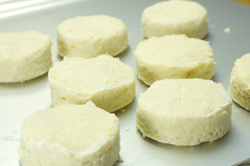 The scraps may be combined to make additional biscuits, although these scraps make tougher biscuits.